I selected the above quote from a dog-eared paperback on my bookshelf entitled, Self-Editing for Fiction Writers by Renni Browne and Dave King. The wisdom contained in those two sentences is priceless. As writers, we become absorbed in the telling of our story so much so that it becomes almost impossible to see its weaknesses. We labor over every phrase—sometimes every word—for hours, days or even weeks. To this day I can’t read my books without recalling how long I suffered over certain passages. Thus, our words become precious to us, our baby so to speak, and it’s as difficult to hear our creation criticized as it is to hear someone speak ill of our child. We rise to its defense, certain that we know best. Sometimes we do, but often we don’t. And that’s when a good editor becomes our best friend. The thought of putting my stories out there for the general public filled me with trepidation. For ten years, I had enjoyed posting in the insulated world of benign fan fiction sites, where, for the most part, harsh criticism was forbidden. If a reader couldn’t say something nice, he shouldn’t say anything at all. That’s a worthy admonition parents teach their children, and it’s a healthy environment for amateur writers to begin. In the real world, however, the world of published books, no such protection exists. If we ask people to pay to read our masterpieces, then we must be prepared to be told they are less than we dreamed. The best way to be prepared for that world is with the sharp blade of a good editor. She saw things that needed to be changed that I would never have seen because I was caught up in characters and plot. Since my books are set in the Regency time period, she forced me to live there in language and actions. Phrases that came into use years later were forbidden no matter how well they fit into the scene. I wrote my books in first-person, and my editor caught every instance in which I stumbled into another point of view. The same goes for writing in the correct tense. She cut sections because of telegraphing. She was like a doctor with a scalpel at cutting out unnecessary words—absolutely merciless. She was obsessed over minutia but, believe me, it paid off. And better grammar—well, that’s a given. Having the benefit of a skilled editor is a reward every writer should treasure. It produced a product of which I could be proud, and frankly, it made me sound a hundred percent better! May I never have to write a book without one! Summary from goodreads:Can a marriage of convenience ever lead to true love? Immediately after Elizabeth Bennet refuses Mr. Darcy’s proposal at Hunsford, her father dies, leaving Longbourn entailed away and little fortune to sustain his widow and daughters. Six months later, the Bennet family receives a visitor with a most unusual offer that promises to save the family from financial and social ruin. Elizabeth’s sense of duty forces her to enter into an arranged marriage with a man she does not even like. 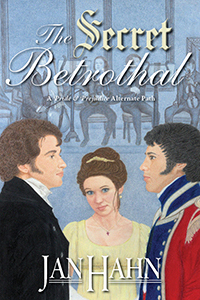 Told from Elizabeth’s point of view, An Arranged Marriage is a compelling twist on Jane Austen’s Pride and Prejudice. Can Elizabeth overcome her feelings of anger, resentment, and suspicion toward her new husband and – the most bewildering sensation of all – a growing attraction for the last man in the world she ever wished to marry? via To Read or Not To Read: Review: An Arranged Marriage by Jan Hahn. Austenesque Reviews: The Journey – Jan Hahn + GIVEAWAY!!! 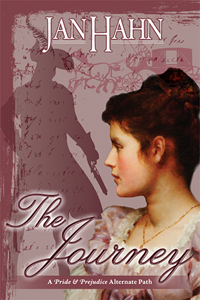 via Austenesque Reviews: The Journey – Jan Hahn + GIVEAWAY!!!. REVIEWER COMMENTS: What a wonderful take on Pride and Prejudice. Hahn does an amazing job staying true to the characters and the dialogues of the time period, and offers a new twist on how Darcy and Elisabeth come to be the happily ever after Mr. and Mrs. Darcy. via An Arranged Marriage by Jan Hahn | Sensible Romance. 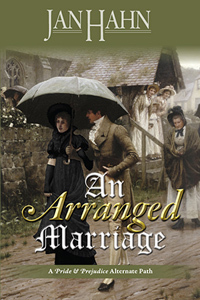 An Arranged Marriage by Jan Hahn does not have a new premise for Austen fiction fans. The Bennett’s will be strained with reduced circumstances unless Lizzy agrees to marry Mr. Darcy. Lizzy agrees and heads off with Mr. Darcy and she is greatly uncomfortable with her new husband she barely knows except to hate. The story follows Elizabeth and Darcy as the misunderstand each other until Elizabeth finally acknowledges her deep feelings of love for Darcy. via my little corner of the world: An Arranged Marriage by Jan Hahn. Whee! "The Journey" is #14 in Amazon's top twenty list of Hot New Releases in Regency Romances! Thanks to Janet Taylor for letting me know.